Tourism has always had a close relationship to photography, capturing exotic and far away places to be shared with friends and loved ones. 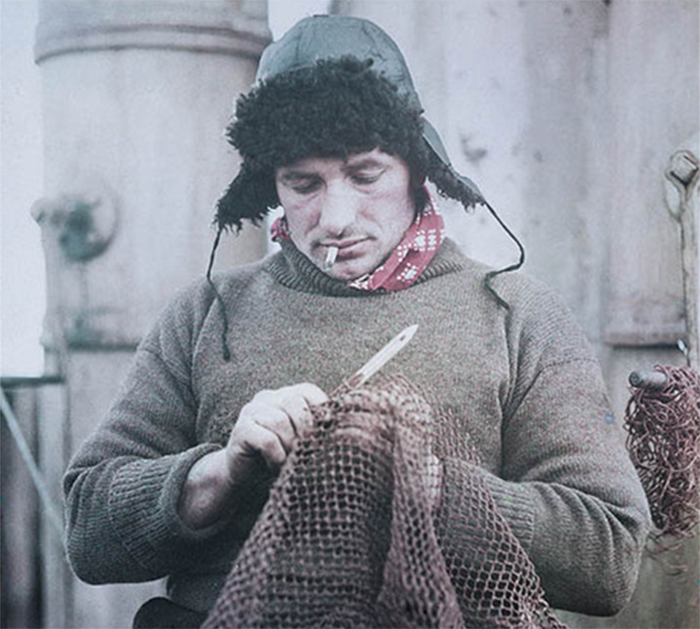 A 100 years ago travel was only available to the privileged few and photographs of remote places was the only way the general population was going experience the realism of the place, otherwise they needed to rely on less precise methods such as drawings or storytelling. This desire for realism, immersion and the sense of "being there" was a driver for innovation in photography. Indeed many of the early advances in photography were tested in the field by travelling photographic inventors attempting to satisfy this desire by the general public to learn more about the world outside their immediate neighbourhood. The development of stereoscopic photography, and more importantly the ability to readily view such 3D photographs with a stereoscope, was developed in the mid to late 1800s. 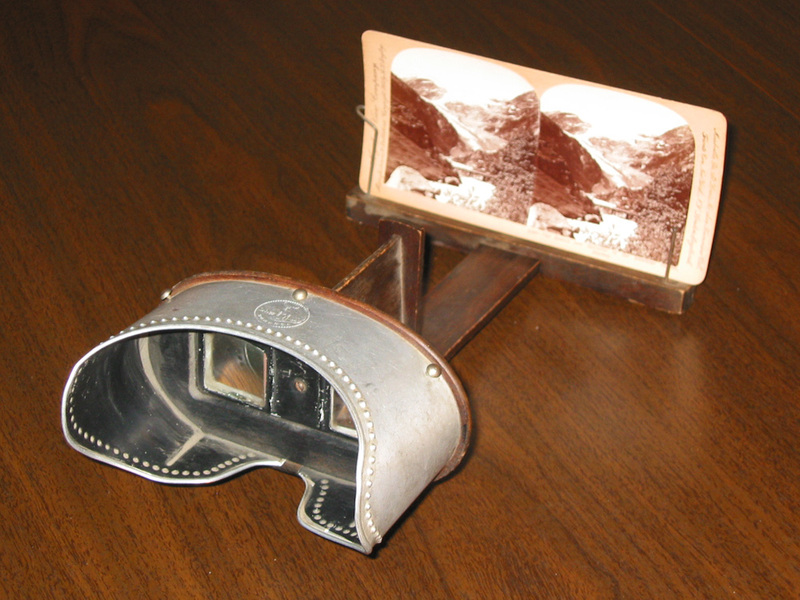 The Brewster stereoscope was demonstrated as early as 1850 and by the end of the 1800s cameras capable of capturing stereoscopic image pairs were commercially available. These cameras, while bulky by today's standards were lugged around the world on expeditions that often lasted years. The resulting stereo pairs, often recorded onto glass plates, rivalled the resolution and image quality of most of the digital stereoscopic cameras that have been available over the last 5 to 10 years. The classic stereoscope is shown above, the stereoscopic pairs were mounted side-by-side, not all that different to the digital standards employed today. Indeed the stereoscope itself and method of operation is largely the same as the HMDs (Head Mounted Displays) that are being marketed aggressively today. Unlike today though, during the 1940s it is estimated that about one third of all households in the UK and America owned such viewers and could enjoy a stereoscopic virtual view of another place or time. As such there was a huge appetite for stereoscopic photographs from distant lands or of notable events. Collections of stereoscopic images could be obtained from across the globe, from hunting expeditions in Africa to cultural events in the East. Many of these are only recently being digitised for viewing on more modern stereoscopic projected displays or HMDs. It should be noted that the stereoscope had some key advantages over the modern HMD, in particular, it didn't isolate the user socially and it provided orders of magnitude higher fidelity. Church of the Nativity, Greek Church in Old Moscow, Russia. Circa 1896. Interesting to contemplate why, with the advent of commodity stereoscopic capable televisions and even the availability of glasses free stereoscopic displays, why stereoscopic photography is rarely employed by tourists, and indeed there is hardly any significant uptake by the general photographic community. While a number of manufacturers were selling stereoscopic cameras just 3-4 years ago they have now reverted to becoming a relatively unusual and specialised piece of equipment. This is in contrast to the hype peaking around 2013 where many people (mostly marketing departments for hardware manufacturers) mistakenly thought stereoscopic capture and viewing would become ubiquitous, of course many of us knew better. Another early innovation in photography was the panorama, a wide angle photograph without the distortion effects of a standard pinhole style perspective camera. This innovation also stems from the very early days of photography and like stereoscopy, pre-dates colour photography. Early panoramas were comprised of multiple images carefully aligned together in the same way as one approach employed in modern digital panorama photography. By the end of the 1800's there were cameras specifically designed to capture panoramas in a continuous process, exposing a roll of film through a narrow vertical slit. Ultimately a panorama extends 360 degrees to provide a complete horizontal view from the position the panorama is captured from. While on occasion the panorama was mounted within a cylindrical chamber for an immersive experience, more commonly they were laid flat and when viewed from close enough provided a undistorted view with context on both sides. In the modern era the digital panorama is the basis for many forms of immersive experience including a natural image format for the HMD or for cylindrical displays employing either projectors or tiled LCD panels. It provides a wide enough image field to support the human visual systems peripheral vision and without any additional computation allows the viewer to look around. In the mid to late 1990s panoramic photography became more commoditised. The stitching algorithms had advanced to the point where anyone could take multiple photographs "casually" and stitch them together to form partial or full panoramas. Most mobile phones today provide a continuous capture of a panorama rather that the discrete image, stitch and blend approach. The panorama is widely used by travelling photographers to capture a more informative representation of a place. 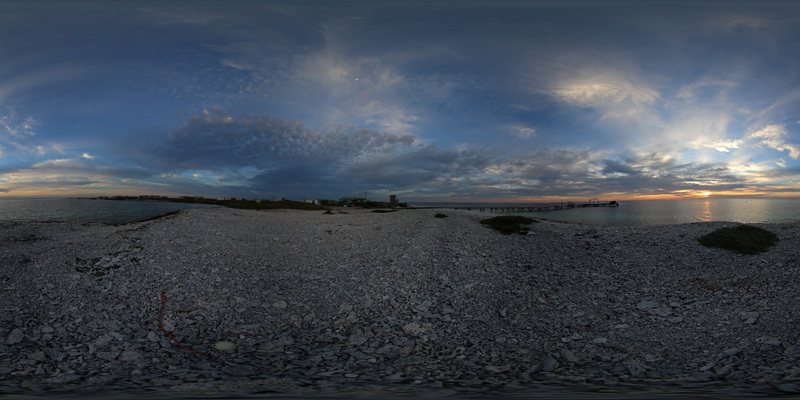 With only a little more equipment one can capture full equirectangular panoramas, extending 360 degrees horizontally and 180 degrees vertically, capturing everything visible from a single location. These panoramas can be processed remotely and uploaded to on-line viewers to give a more informed and interactive experience of the remote place. The distant viewer sees the entire location without any selection process by the photographer. That stereoscopic and panorama photography developed before colour photography is notable from the viewpoint that many consider these to be modern inventions aimed at providing a sense of immersion. Certainly the lack of colour was a major limitation to being able to faithfully capture the essence of a remote location. 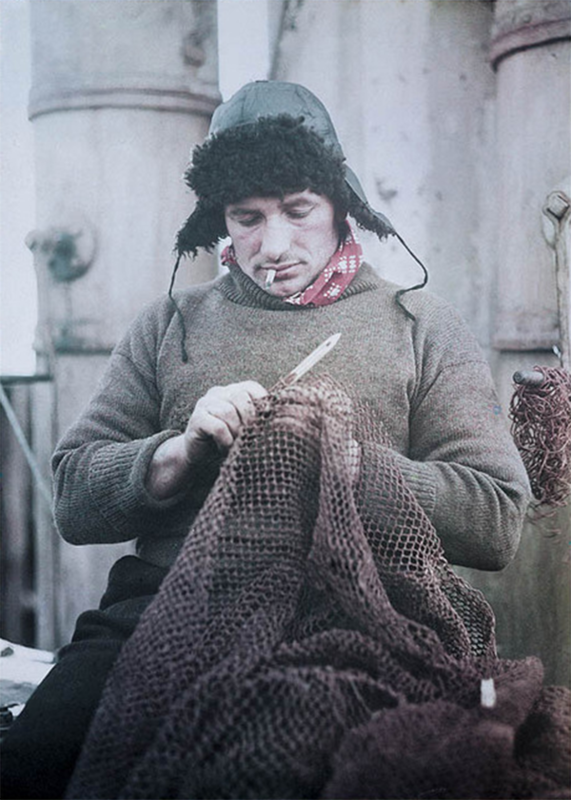 An early form of colour photography called the Paget process was invented in 1912 by G.S. Whitfield and used multiple pigments arranged in a lattice. The same lattice was used as a filter to capture the image as to present it. The process is not all that different to the arrangement of different red, green, blue elements in modern LCD displays or colour printing processes. It was used by the Australian photographer Frank Hurley on the Ernest Shackleton British Imperial Trans-Antarctic Expedition between 1914-1917. This is testament to how important faithful representation was given that this was an expedition to one of the most remote locations on Earth. 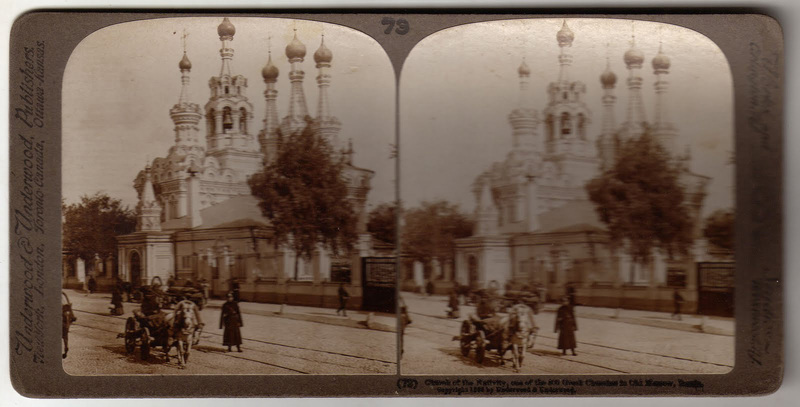 While stereoscopic photography is now relatively uncommon, of course colour is now taken for granted both in the ability to faithfully capture in colour but also to be able to appreciate the distant place both in print and on modern digital displays. There are still challenges for the touristic photographer largely when it comes to capturing wide ranges of brightness in a scene or very dark spaces. Support for HDR (High Dynamic Range) photography is built into most cameras these days to assist in photographing scenes with a range of intensities that can be handled by the high dynamic range of our eyes but not photographic sensors. And similarly long exposures can capture dark spaces. Both require a degree of planning, generally only suited to stationary scenes and a tripod. The search for novel and new methods to represent a remote site or object continues in photography and there are techniques only possible in the modern digital era. In the search for richer digital recordings of a site, so called gigapixel imaging provides panoramas that offer a depth of zooming not otherwise achievable with a single photograph. Various methods are used to capture time and space within a single image, this includes the familiar multiple exposure and the more exotic slit scan photography. Stereographic projections, also called "little planet" projections that are derived from full 360x180 equirectangular projections provide a unique perspective of a place. So called chronopanoramas combine the panorama with a discrete form of time lapse. And of course one can now throw a drone into the air for otherwise not possible perspective on the world below. 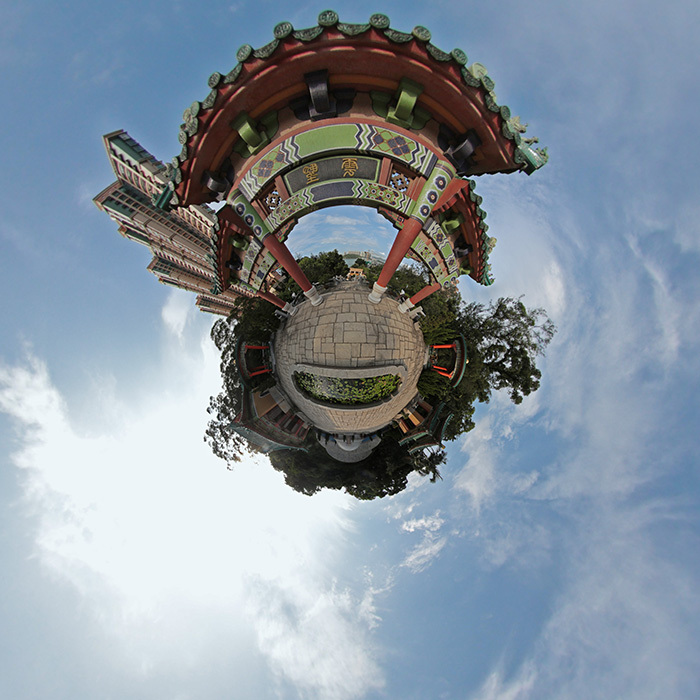 Example of stereographic projection. Dragon Gardens, Hong Kong. (Author). Digital photography is now in the hands of everyone with a digital phone and is a largely zero cost process. At the same time the barrier to travel has significantly reduced over the last 50 years and as such the demand for photographs that are not your own has diminished. Simultaneously the internet has made it possible to share photographs both privately and more widely. This is clearly evident in the market for postcards which in many tourist destinations has disappeared. The mobile phone is ever within reach and transmitting an image to friends and family is as easy as tapping on the screen a few times. In recent times the ability to create a 3D model of an object or scene is as easy as taking a number of photographs and running them through some readily available software. In order to convey a sense of a foreign artefact or location, instead of supplying one of a number of photographs from different positions, why not supply a full 3D model and let the viewer choose the view point. This first example is from an engraving within the Ho Ann Kiong Temple in Kuala Terrengganu. A few as 6 photographs provides the following 3D model. This second example is a more challenging fully 3D object requiring many more photographs for a reasonable model, in this case 180 photographs. Photographically derived reconstructions are not limited to objects, the following 3D environment, a rock shelter used by indigenous Australians for perhaps tens of thousands of years, is ideally suited for immersive exploration using head mounted displays. No one seriously believes head mounted displays like the Occulus will become pervasive in the same way as the stereoscope was (albeit briefly). The beauty though with 3D models is that they have more chance to be re-purposed and experienced using a range of technologies including ones that may arise in the future. For example a 3D model can be used to create a synthetic hologram. Already there are on-line services where these models can be experienced interactively or in an immersive way using HMDs. Is this the new frontier in touristic photography? Sites are already available on-line by which one can upload and share the photographically derived 3D models. In the same way as one can find normal photographs of almost any location on Earth, will we eventually have 3D model archives, at least of interesting objects? Colour photography clearly survived, panorama photography is widely used, stereoscopic photography while not widely used is well understood, will photographically derived 3D models become widespread or remain a relatively specialist activity? Will the algorithms involved find their way into mobile phones so the process becomes as simple as it currently is to capture and share panoramas.